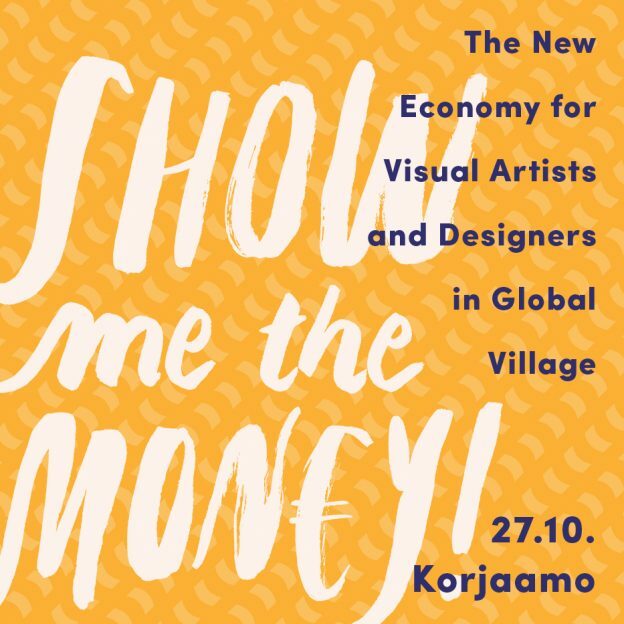 Seminar on financial strategies for creative work: Show Me The Money! Tickets: 20 € for Aalto University students and for Kuvasto and Grafia members / 40 € for others. The seminar event on Facebook. This entry was posted in Art, Design, Event, Graphic Design, New Media, Photography, Seminars on September 23, 2016 by Saara. Kaksoisolemuksia / Double Appearances –työpajan päättää kolmepäiväinen yleisölle avoin tapahtuma MUU Galleriassa. / The Double Appearances workshop will conclude with a three-day public exhibition in MUU Gallery. MUUn toteuttama Kaksoisolemuksia / Double Appearances on myös osa Pixelache 2016 – ‘Interfaces for Empathy’ -festivaalin ohjelmaa. / Double Appearances is part of the programme of the Pixelache 2016 festival ’Interfaces for Empathy’. Tapahtuman koordinaattorit ovat mediataiteilijat Jukka Hautamäki ja Roberto Pugliese, MUUn toiminnanjohtaja Timo Soppela ja Pixelachen toiminnanjohtaja Petri Ruikka. / The workshop coordinators are media artists Jukka Hautamäki and Roberto Pugliese, MUU director Timo Soppela, and Pixelache director Petri Ruikka. Työpajan toteutusta on tukenut Opintokeskus Visio. / The workshop is supported by Educational Centre Visio. Avoinna: pe 23.9. klo 20-22, la–su 24.–25.9. klo 12–16. Neljän päivän työpaja – ideoiden, ajatusten ja käytännön taitojen käytännönläheinen ja intensiivinen yhteistyöfoorumi – tuottaa ääni-instrumentteja ja mediataideteoksia, jotka esitellään yleisölle avoimessa päätöstapahtumassa. Uusi mediateknologia lupaa kokemuksia koko keholle ja aisteille jopa siinä määrin, että se vaikuttaa voimakkaasti havaintokykyymme ja tietoisuuteemme. Työpajan ja tapahtuman tavoitteena on sekä teoreettisesti sekä käytännössä lähestyä ja suunnitella uusia välineitä sosiaalisiin kohtaamisiin. Mediataide voi tarjota paljon näkökulmia kriittiseen keskusteluun teknologiasta, sen riskeistä ja tekniikan lumoavuudesta. Osan työpajojen kontekstista ja innoittajana toimivat Erkki Kurenniemen osallistavat ääniteokset. Työpajan nimi viittaa ääniteoksien mahdollisuuteen vaihtaa olemustaan kontekstin mukaisesti. Näyttelytapahtuman avajaisjuhlia vietetään perjantaina 23. syyskuuta klo 20 alkaen. Avajaisten ohjelmaan kuuluu työpajan taiteilijoiden projektien esittely ja Jukka Hautamäen sekä Roberto Pugliesen & Andrea Manciantin ääniperformanssit. Taiteilijat Jukka Hautamäki ja Roberto Pugliese ovat työpajan ohjaajia. The four-day hands-on workshop is an intense forum for cooperation to exchange ideas, thoughts and practical skills. It will involve the creation of sound instruments and media artworks that will be presented to the public in the concluding exhibition. New media technology generates intense experiences for the entire body and all the senses, to the extent that it powerfully affects our perceptions and our consciousness. The aim of the workshop and the concluding exhibition is to explore and design new instruments for social encounter, both in theory and in practice. Media art can offer many perspectives on the critical discourse on technology, its risks and its fascination. 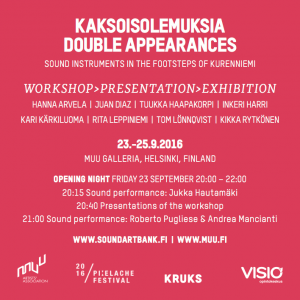 Some of the context and the inspiration for the workshop is provided by Erkki Kurenniemi’s participatory sound works. The workshop title is a reference to the capacity of sound art to alter its appearance to fit the context. 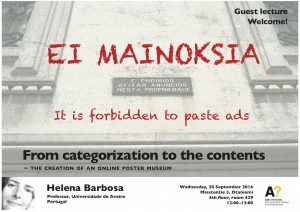 The opening night of the concluding exhibition is on Friday, 23 September, starting at 20:00 hours. 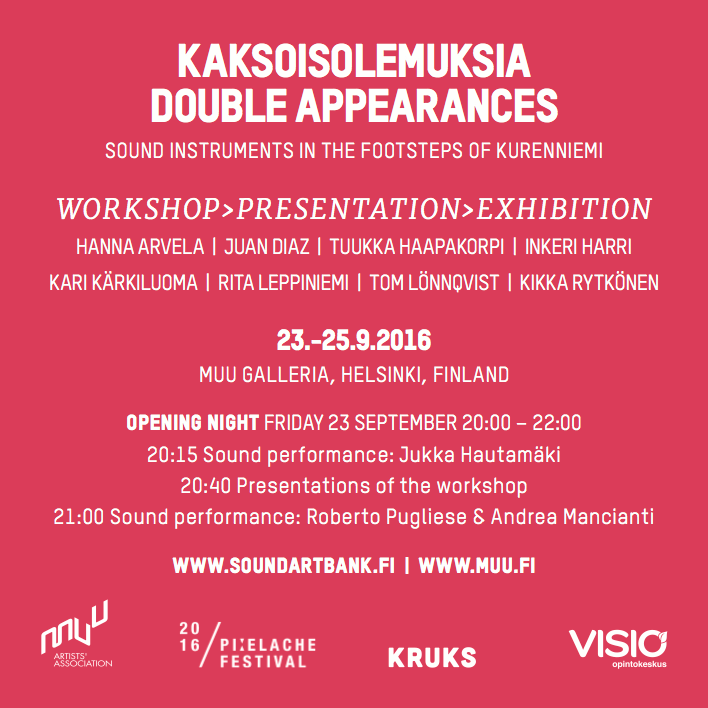 The programme includes presentations by workshop participants and sound performances by Jukka Hautamäki and Roberto Pugliese & Andrea Mancianti. The workshop leaders are Jukka Hautamäki and Roberto Pugliese. This entry was posted in Art, Event on September 22, 2016 by Saara. Welcome to the first session of our Doctoral Seminar this semester. Miestentie 3, OTANIEMI, 4th floor, room 429. Hung Han Chen will present work on his doctoral dissertation on Affective Archives. 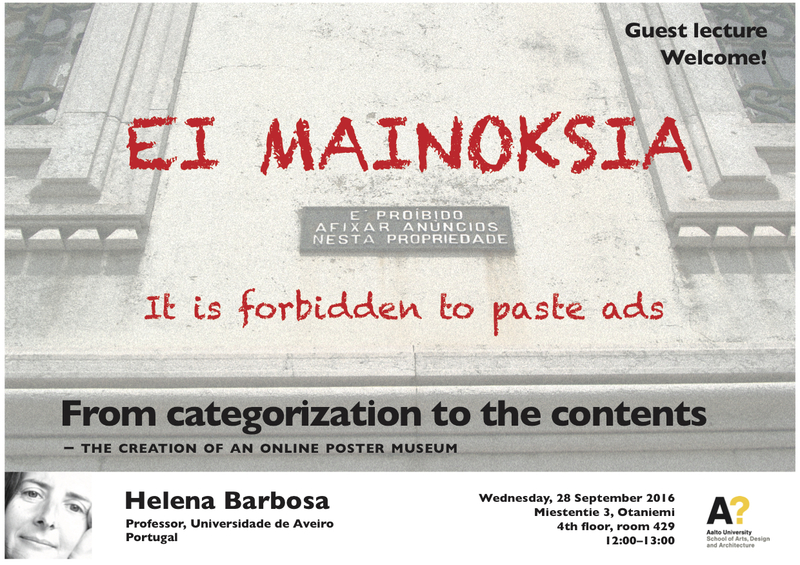 Note that MA students are specially welcome to attend the presentation. A Study of Representations of Affections in Digital Era. Media Archaeology of Affective Archive. This presentation discusses the representation of emotions in the digital era. My thesis is a media archaeology of representative affective media. I will present the introduction of my thesis that includes the research background, motivation, and research questions. The main contribution of the thesis is the design of a tool that generates the representation of ontology of affects. The tool heavily depends on emotion theories in the digital era, therefore, my thesis is composed of studies of theories as well as practice. The theoretical part of my thesis is influenced by affect theories and the affective turn in disciplines and discourses on feelings, emotions, and moods. The hypotheses and concepts of emotions are based on Henri Bergson and Gilles Deleuze’s theories. The practical outcomes of the thesis are digital tools that enable us to develop ontologies from various types of digital media archives including early 20th cinema samples. In these ontologies entities are used to represent complex emotions such as shame and personal digital footprint. This entry was posted in Lecture, Seminars, Theory on September 19, 2016 by Saara. Second edition of art and science conference series in Europe and the Baltic Sea region. Baltan Laboratories, Eindhoven (NL) – January 20 – 22, 2017. Renewable Futures aims to invent new avenues for more sustainable and imaginative future developments. The first conference took place in Riga (LV) exploring the transformative potential of art. The second Renewables Futures conference will take place in Eindhoven, aiming to push the boundaries of our thinking about economy. The conference will be a part of Economia festival organized by Baltan Laboratories in Natlab, former physics lab of Philips. Economia is a three-day festival in which we collectively explore new ideas and thinking about our economy. The event is a laboratory for ideas, a place where we can step out of the existing frame. We will use unexpected and playful approaches looking at the essentials of economy, thus establishing a fresh point of view on the economic system and our society. In the eighties economics transformed more and more into a so called hard science. Economics reduced its various approaches of our complex and unpredictable economic behavior, to one comprehensive theory known as the neoclassical or neoliberal model. This model captured economic behavior in mathematical formulas. It had the beauty of simplicity, the predictability of a formula and sounded too logical not to be true. Like most powerful technologies dating from after the Second World War, economics has influenced the world of our ideas, how we define ourselves, and how we organize our society. Just as the discovery of DNA forced us to look differently at life, and the developments in ICT made our world smaller in unprecedented ways, the neoliberal model caused a huge shift from common interest to individual interest, and from a long term view to a short term view. It is striking how little imagination this hard economic approach generates. Economics has no equivalent of multiple universes, singularity or space-travelling. No strange life forms in the depths of the ocean or on other planets, no artificial or eternal life. Economics is astoundingly prosaic and, rather than to explore and push the boundaries of its own domain, it seems to move inward, in precisely the opposite direction. Since the outbreak of the financial crises in 2007/2008, uncertainty about the effectiveness and validity of the neoliberal model has grown considerably. Economics, as a social technology in its present form, provides no solution to issues of climate change and social inequality. It cannot help us organize social alliances, public interests or develop long-term prospects. Its results no longer appeal. The added value of efficiency and productivity are outweighed by the numerous disadvantages of reducing all values to market value. Although critique on the neo-liberal model grows, no new answers or alternatives have been proposed yet. In the search for new economic insights and alternatives to the current model, why not start by treating economics like any other technology? Playing with it, hacking it, using input from other disciplines, unleashing science fiction on it, approach it in an artistic manner. In short, taking ownership so that we can reshape and rework economics as we see fit. Because however meaningful, criticizing the current model won’t rid us of it. And we aim to do precisely that. The aim of the festival and conference is to approach economics in new ways and look at our economic system and society with the detached view of the visitor, researcher, gamer, alien and artist. We want to reclaim economy as a social/cultural structure that we created, ridding us of the idea of economics as an inevitable law of nature. Economy as evolution: economics is about development and evolution. Societies develop and the direction they take is determined partly by the type of economic relationships they develop. Parallels are often drawn between these developments in culture and those in nature. Economics as a game: economics is about rules and laws. Just like other types of relationships in the edifice of a society, an existing system of economic relationships adheres to certain laws and regulations. Gaming is about learning the laws and rules of a game so that you can play it better and better. Economics as a fiction: economics is about ideas and faith. Credit has existed right from the start of societies, in the form of trust that A would pay B. Just as today, you would do a task for future reward in whatever form. Every form of economic relationship is an idea, or to put it better perhaps a prejudice. Which means it can change. Economics as a market: economics is about supply and demand. The greatest and most misunderstood cliché. Demand and supply is a way to describe life. Each influences the other in an unpredictable and complex ways. Economics as magic: economy is both tangible and invisible. We are familiar with two forms of trade, goods and money. The one that you can handle and the other that exists only in the form of ones and zeros. The latter seems like pure magic. It is with good reason that some of these ‘financial wizards’ call themselves ‘Master of the universe’. Proposals should explore at least one of the 5 proposed themes, which are at the heart of this conference. Selected speakers are invited to present their papers as part of the conference and are encouraged to engage within lively discussions amongst peers, experts, and the general audience. Paper requirements: Length of abstract: 250 words max. + short biography: 100 words. Deadline for submitting your proposal is 30 September, 2016. Notification for acceptance will be sent before 15 of November. proposals for developing or showcasing art projects (installations, performances, video based work, etc.) should contain a description of the art project (max 1 A4), with a minimum of 2 photo’s and/or a link to website referring to previously developed works. Selection of artworks will be based on quality, feasibility and the connection to the overall theme. Deadline for submitting your proposal is 30 September, 2016. Notification for acceptance will be sent before 15 November. Send your proposal to Olga Mink, info@baltanlaboratories.org, subject: Artwork proposal Renewable Futures Conference 2017. Conference chairs: Rasa Smite (RIXC), Olga Mink (Baltan Laboratories), Wiepko Oosterhuis. – Dan Diojdescu (MBA). Teacher Economics at Avans School of International Studies (ASIS). Organizers: Baltan Laboratories in collaboration with RIXC and Renewable Future European network. Early Bird registration will open autumn 2016. Conference tickets will also grant access to the Economia festival. The conference participants will be asked to take care about covering their own travel and accommodation costs. We will provide you with official invitation letters, encouraging to apply for travel support at your home universities. Selected exhibition artists will be asked to cover all the artwork production costs by themselves – we only will cover the costs related to the exhibiting the works in Eindhoven. 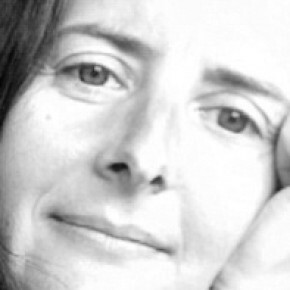 We have limited funding to support travel and accommodation for independent artists and researchers from Europe. Also, as we welcome proposals from countries outside of the EU, we are offering a possibility to apply for covering either your European part of travel, or accommodation costs. * For academic scholars and PhD students – after the notification (November 15, 2016), we will provide you with an official letter of invitation, addressed to your university (upon request). * For independent artists and/or researchers – who are not able to cover their travel costs, there will be possibility to apply for travel support. * For artists and/or representatives from art/culture organizations – partial support (i.e. accommodation) can be considered upon the individual request. This entry was posted in Seminars on September 15, 2016 by Lily.